Anterior spinothalamic tract is labeled in blue at bottom right. 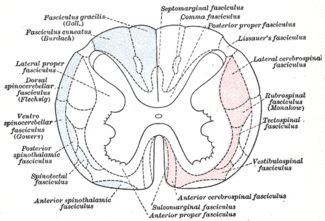 The ventral spinothalamic fasciculus (or anterior spinothalamic tract) situated in the marginal part of the anterior funiculus and intermingled more or less with the vestibulo-spinal fasciculus, is derived from cells in the posterior column or intermediate gray matter of the opposite side. This tract is primarily associated with the conduction of soft nociceptive information to the reticular formation in the thalamus. 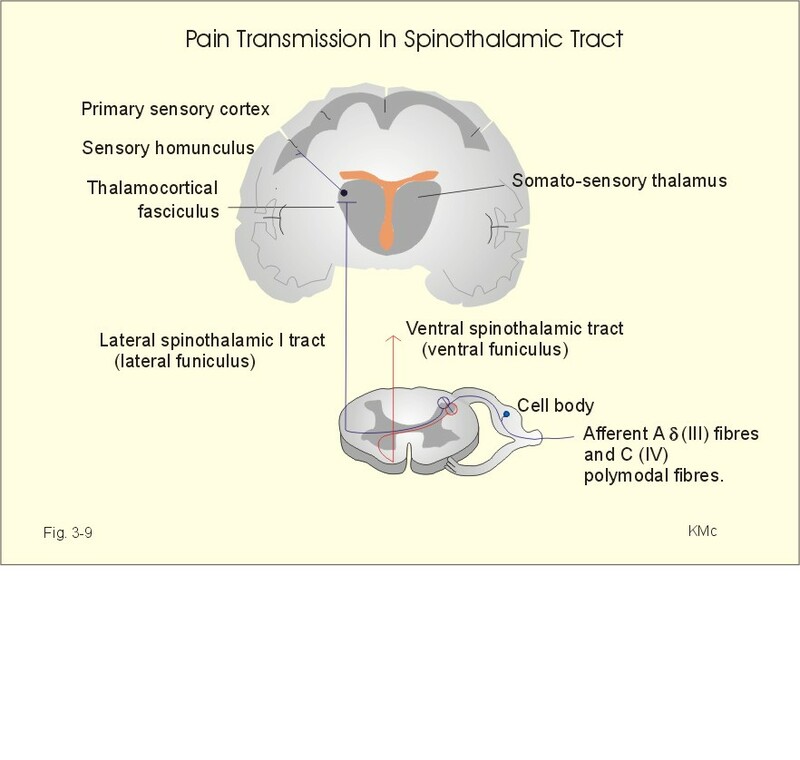 The fibers of the anterior spinothalamic tract conduct information about pressure and crude touch (prothopatic). The fine touch (epicritic) is conducted by fibers of the medial lemniscus. The medial lemniscus if formed by the axons of the neurons of the gracilis and cuneatus nuclei of the medulla oblongata which receive information about light touch, vibration and conscient proprioception from the gracilis and cuneatus fasciculus of the spinal cord. This fasciculus receive the axons of the first order neuron which is located in the dorsal root ganglion and that receives aferent fibers from receptors in the skin, muscles and joints.